A new paper published in Climate of the Past reconstructs June-July sunshine hours in Bosnia- Herzegovina from 1660 - 2010 and finds a significant increase in sunshine over the past 50 years to some of the highest levels of the past 350 years. 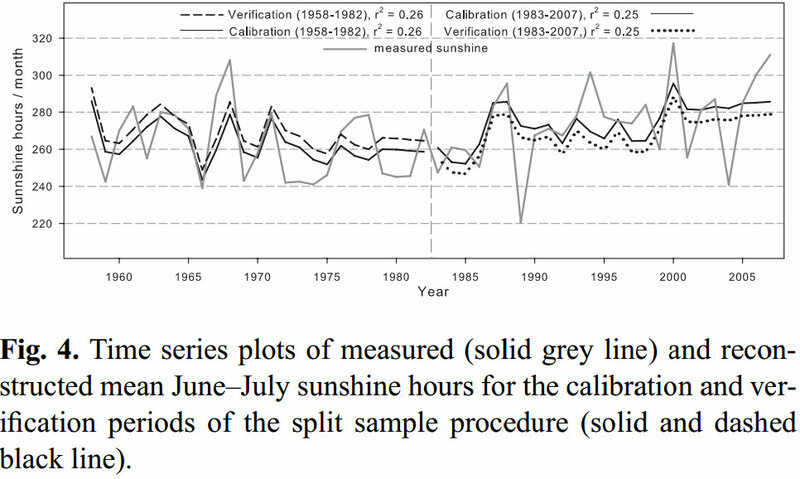 In addition, the paper shows measured sunshine hours increased ~ 15% from 1958 to 2007, the effect of which would dwarf the alleged warming effects of increased CO2 over the same period*. 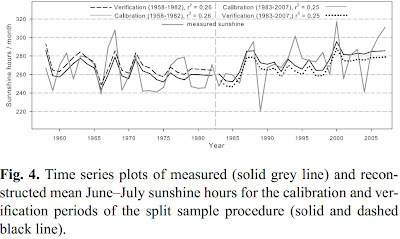 The paper adds to many others demonstrating an increase of sunshine hours or 'global brightening' at various locations around the globe during the latter 20th century which could more than account for all observed global warming. Calibration of measured sunshine hours to the reconstruction. Measured June-July sunshine hours (solid grey line) have also shown an increase since the 1960's. * 240 Wm-2 * 0.15 = 36 Wm-2 forcing due to increase in sunshine hours vs. ~ 0.2 Wm-2 alleged forcing at the Earth surface from increased CO2 over the same time period. Abstract. We present the first summer sunshine reconstruction from tree-ring data for the western part of the Balkan Peninsula. Summer sunshine is tightly connected with moisture stress in trees, because the moisture stress and therefore the width of annual tree-rings is under the influence of the direct and interactive effects of sunshine duration (temperature, precipitation, cloud cover and evapotranspiration). The reconstruction is based on a calibrated z-scored mean chronology, calculated from tree-ring width measurements from 7 representative black pine (Pinus nigra Arnold) sites in Bosnia and Herzegovina (BiH). A combined regression and scaling approach was used for the reconstruction of the summer sunshine. We found a significant negative correlation (r = −0.54, p < 0.0001) with mean June–July sunshine hours from Osijek meteorological station (Croatia). The developed model was used for reconstruction of summer sunshine for the time period 1660–2010. We identified extreme summer events and compared them to available documentary historical sources of drought, volcanic eruptions and other reconstructions from the broader region. All extreme summers with low sunshine hours (1712, 1810, 1815, 1843, 1899 and 1966) are connected with volcanic eruptions.